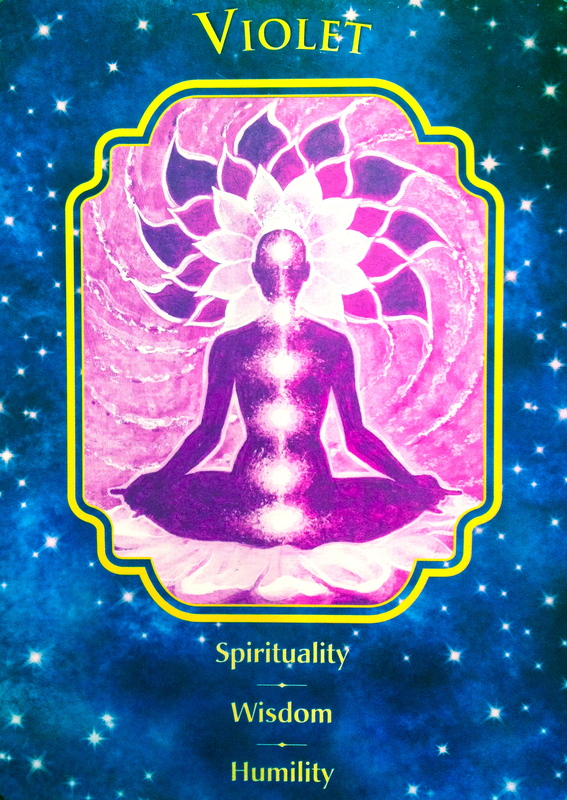 “This card is here to remind you of the wisdom of humility on the spiritual path. All gifts are given equally and without discrimination. Violet represents the blending of the red (root) and blue (third eye) chakras, which suggests that a balance of passion and calm is needed now. This card has come to help you keep a balanced perspective with respect to the practical and spiritual aspects of life. This message asks us to step onto our life path. To become of service without expectation of those you assist. This does not mean that you do everything for free, or that you suffer in any way to provide to others, but rather that you set up a cycle of balanced give and take from the Universe. It means that you do what you love, helping those who need it, knowing that the Universe will always provide; for them and for you. No one is higher or lower, it is not a contest or a comparison. We do not weigh our options to see what is “in it for us” but we trust that everyone, including ourselves are worthy of only the best, and put our hand in to do our part. The gifts that you have are beautiful and unique. As are the gifts of everyone else. Rather than envy another of their gift, search deeply within for your own light. When you have found it, blend your light with the lights of others around you and see you all shine more brightly. There is no one better and no one worse. We are all one. We are called to relinquish our strangle hold on the material. It insists that we see the beauty in every living being; the inherent light; the wholeness. It asks that we look closely at what we consider to be important, vital even, to our existence, and to release the ties that bind us to the world of material possessions. Trade it all in for love, simplicity, lightness of being. Take what you need for all is provided as it is needed; an excess will do you no good. Trust in your own capabilities and step onto your path. Trust in yourself and your gifts, of set boundaries where needed, see the equality and connection around you, move forward fearlessly but always with respect, focus on your own value and self worth. Tapping into the heart center and trusting in your intuition. I trust in my own capabilities to create the life of my dreams.